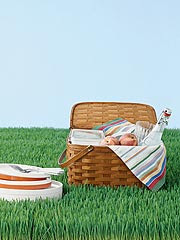 Real Simple is offering a Guide to the Best Summer with perfect picnic recipes. I thought this gourmet "fried" chicken sounded perfect to go with a watermelon, potato salad, chocolate chip cookie and lemonade picnic. 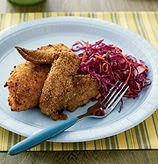 Remove and discard the skin from the chicken. Combine the chicken, buttermilk, garlic, and gin in a large resealable plastic bag. Refrigerate at least 1 hour or overnight. Heat oven to 400° F. Lightly coat a large baking sheet with vegetable cooking spray. On a sheet of wax paper, combine the bread crumbs, Parmesan, salt, lemon zest, and thyme. Roll the chicken pieces in the coating and place on the baking sheet, bone-side down. Bake 35 to 40 minutes, turning the chicken halfway through, or until crispy and the juices run clear when the chicken is pierced with a fork. This looks good Kelli! And totally inspires me to get a picnic going this week. It doesn't look that hard either. Perfect combination.